We review the new Sony Alpha A5000, the compact mirrorless camera features a 20.1 megapixel sensor and built in Wi-Fi. The Sony Alpha A5000 is this years update to the Sony NEX-3N, and is one of the smallest APS-C sensor mirrorless cameras with a built in flash. The updated A5000 adds built in Wi-Fi and NFC, as well as a new 20.1 megapixel sensor, instead of the 16.1 megapixel sensor on the 3N. 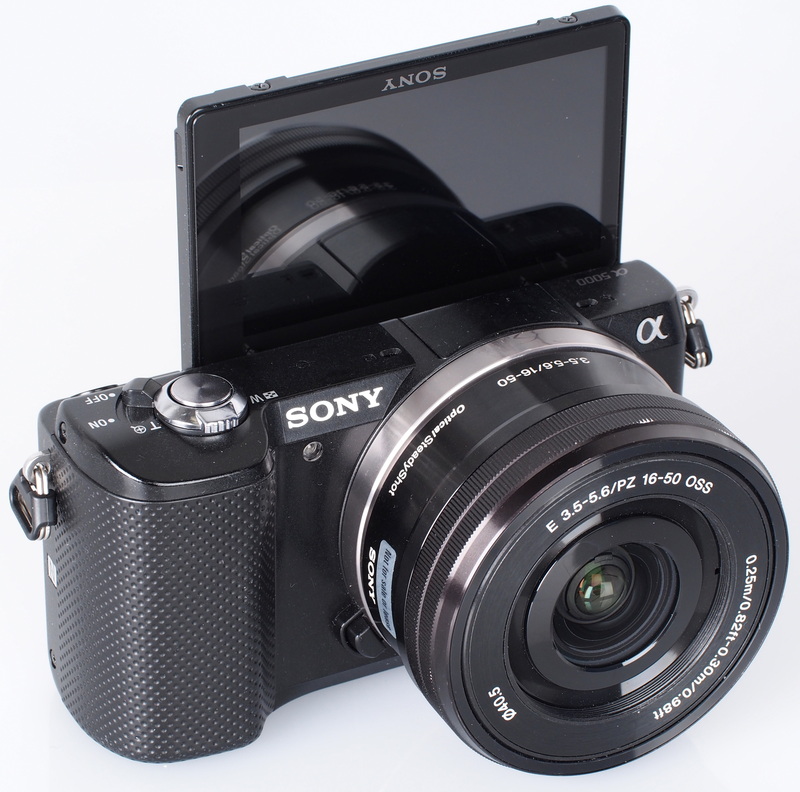 The Sony Alpha A5000 is priced at £399 (RRP) with the compact 16-50mm lens shown here. The camera features a tilting 3inch screen and ISO sensitivity is manually adjustable up to ISO16,000. 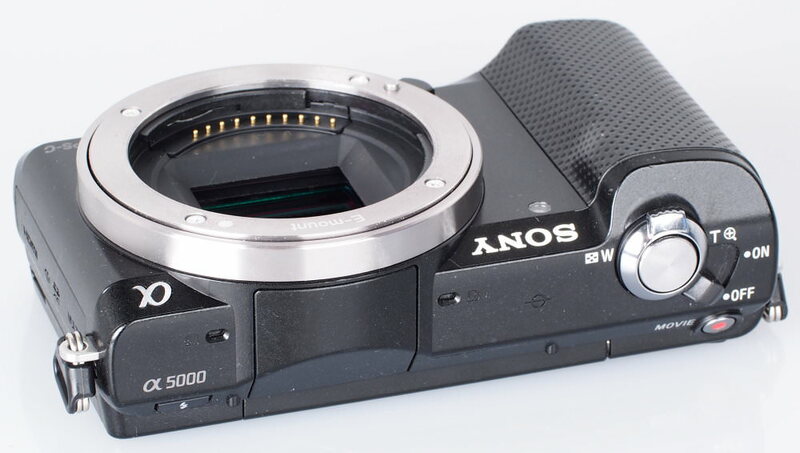 The Sony Alpha A5000 has a 20.1 megapixel APS-C sensor. 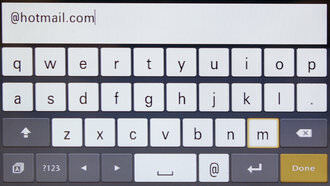 It has built-in Wi-Fi, and NFC, to allow it to connect to devices such as smartphones or tablets. There is a BIONZ image processor designed to produce clear, detailed, low noise images shooting up to ISO16000. Photos can be uploaded directly to Facebook (using the Direct Upload app) from the camera with other apps available as well, including one which allows you to use your smartphone as a remote control. 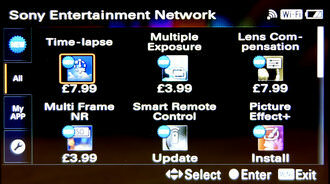 There are plenty of apps to download on the PlayMemories Camera Apps website, some are free, and some cost money. To help take creative pictures there are a number of picture modes such as poster effect, miniature and selective colour. The camera will automatically crop portrait photos creating a second copy of the photo. Videos are recorded in full HD with stereo sound, and using the power zoom lens can zoom in and out without losing focus. The Alpha A5000 is available with the 16-50mm Power Zoom lens, which is collapsible when switched off, making it extremely compact. The lens is the equivalent of 24-75mm in 35mm terms, and features optical image stabilisation. The Sony Alpha A5000 has a compact plastic body and a good rubberised hand grip, as well as a plastic square on the back for your right-hand thumb, and weighs just 210g without lens. There is a built in pop up flash that is activated with a small button next to the flash. 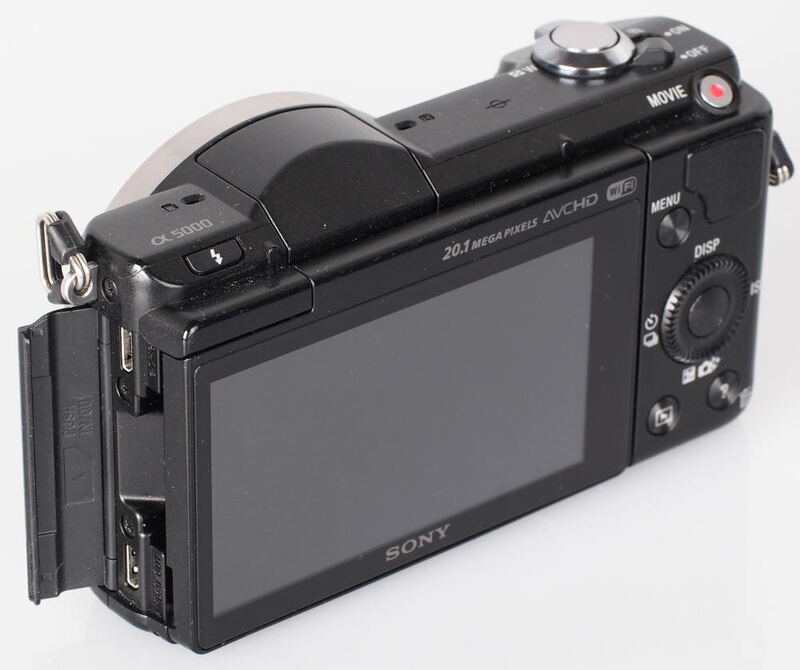 On top is an on/off switch, as well as the shutter release button that is surrounded by a zoom-rocker lever, this can be used to control the power zoom, or zoom into photos in playback mode. 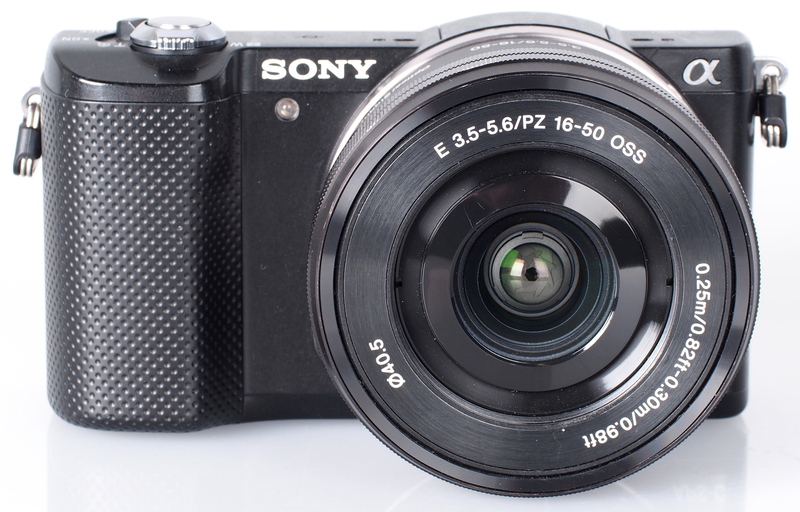 The rear scroll wheel makes it easy to cycle through the menus, and the camera benefits from the Sony Alpha style of menus, rather than the Sony NEX menus, making the camera more familiar for other Sony users. The 3 inch screen is tiltable at up to 180 degrees, ideal for shooting with the camera low down or taking perfectly framed self-portraits. When tilted forwards the camera will automatically switch to self-portrait mode and countdown before taking the photo. 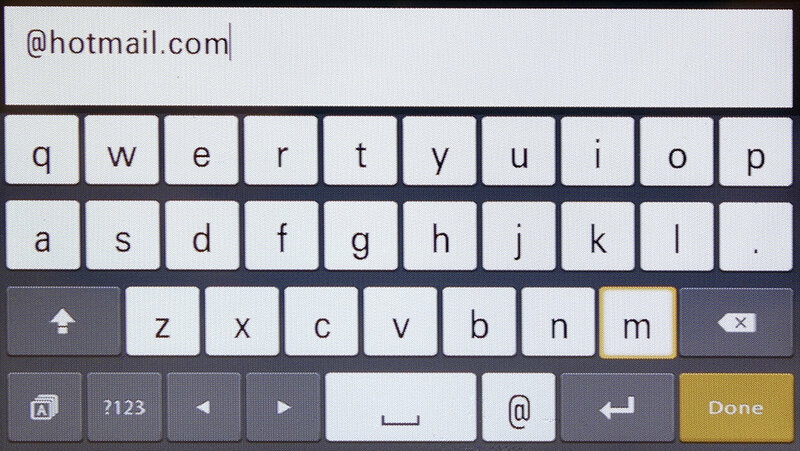 The screen has a good resolution and is easy to view with a "Sunny Weather" setting available for when you are outdoors in the sun, this brightens the screen and makes it easy to see in sunlight. 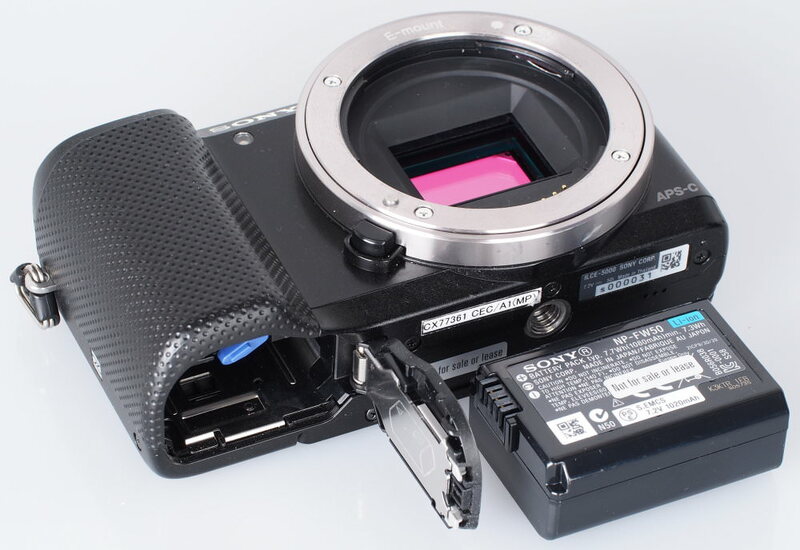 A memory card slot can be found on the left hand side under the HDMI/USB flap, and the camera will take either Sony Memory Sticks or SD memory cards. The camera feels better than the low price would suggest, with the rubber grip helps to give a good impression, and build quality appears to be very good. When you've set it to connect to your Wi-Fi network you can access the applications where you can use any that are already installed, or download more. Some app cost money including Time-lapse (£7.99), Multiple Exposure (£3.99), Lens Compensation (£7.99), and Multi-Frame NR (£3.99), with Direct Upload, Photo Retouch, Flick Add-on, Smart Remote Control, and Picture Effect+ free. 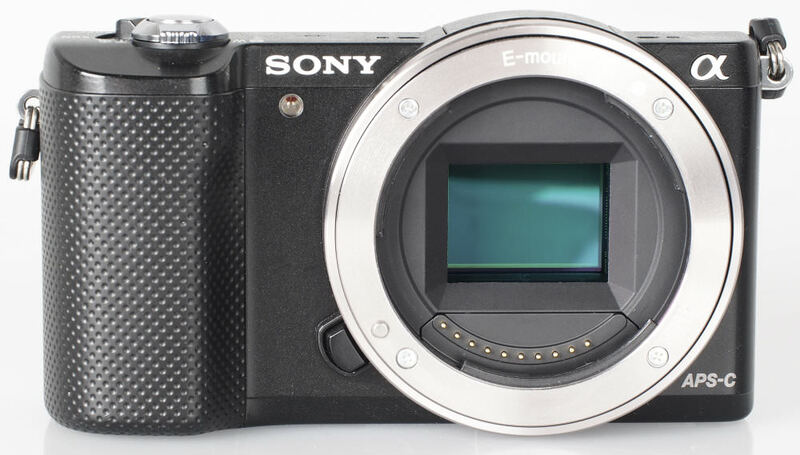 Battery life is rated at 420 shots according to CIPA test results, with the camera using a Sony Info-lithium rechargeable battery, which means the camera is able to tell you exactly how much battery life is left as a percentage, for example, 51%. Switch on speed is a little slower than expected for this class of camera, however that's due to having to wait for the power zoom lens to extend. 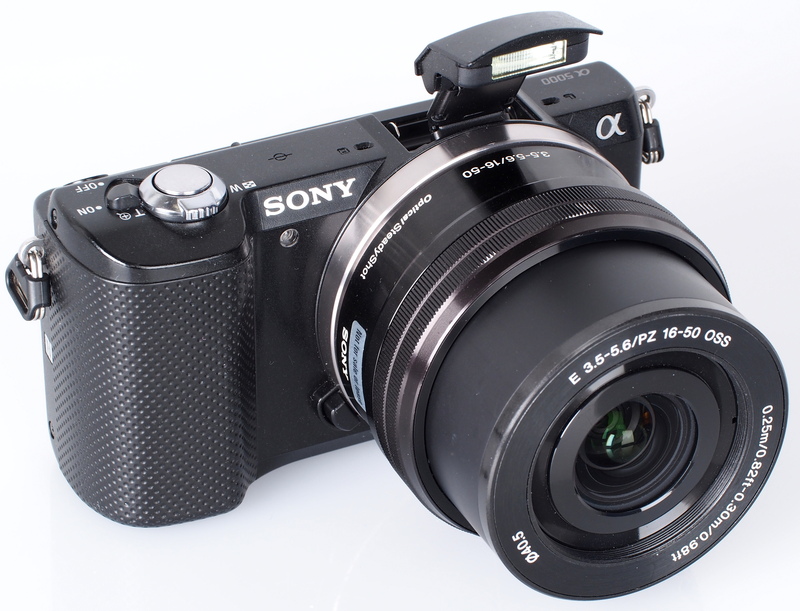 Focus and shutter response, is very good, although continuous shooting isn't as fast as other Sony Alpha / NEX cameras. I believe Sony are dropping the NEX label. and using "A" for interchangeable lens cameras, Divided by size. eg: Alpha fit lenses and "E" fit for the smaller range. The fixed lens range are the Cyber-shot: not to be taken lightly as full frame professional ones will cost you nearly £2,500. I have trialled pre-production cameras and when the firmware is updated for production it changes so much. I wait for the chance, to try this. At about £400 with 20mp a camera that fits in your pocket, must be worth considering for newbies. Divided by size. eg: Alpha fit lenses and "E" fit for the smaller range. The fixed lens range are the Cyber-shot: not to be taken lightly as full frame professional ones will cost you nearly £2,500. 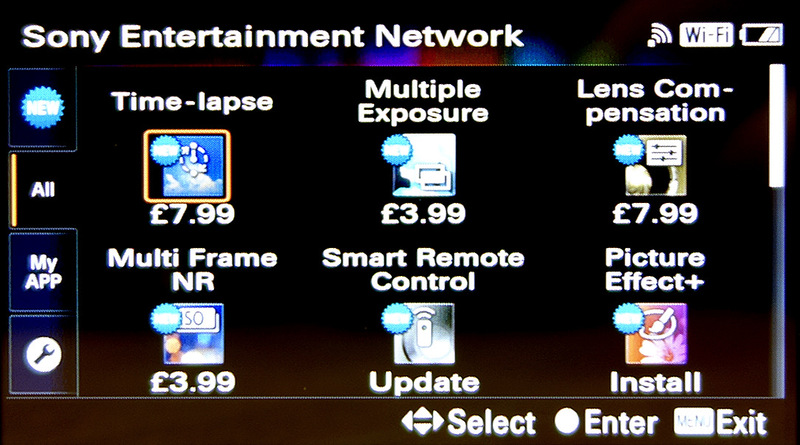 I have trialled pre-production cameras and when the firmware is updated for production it changes so much. I wait for the chance, to try this. At about £400 with 20mp a camera that fits in your pocket, must be worth considering for newbies. Did you shoot any RAW test images? Hi, we will upload RAW images as soon as possible. Thanks. I am sorry to say no matter how good Sony cameras are, I will never buy one of their cameras, purely because of the nasty App purchase system. They are cutting features from cameras then charging extra for them. In theory it's a great idea, as it can extend the life of the camera, but as no camera manufacturer would ever want that, it only going to be used by them to make them a quick buck. I don't want to rant but I really don't trust Sony (Or Canikon or Samsung or anyone) to be honest with it. We will end up with the same problem as the rip off microtransactions on mobile phones. They have pay to win, we will end up with pay to shoot! I am sorry to say no matter how good Sony cameras are, I will never buy one of their cameras, purely because of the nasty App purchase system. They are cutting features from cameras then charging extra for them. In theory it's a great idea, as it can extend the life of the camera, but as no camera manufacturer would ever want that, it only going to be used by them to make them a quick buck. I don't want to rant but I really don't trust Sony (Or Canikon or Samsung or anyone) to be honest with it. We will end up with the same problem as the rip off microtransactions on mobile phones. They have pay to win, we will end up with pay to shoot! RAW files are now available, just click the RAW link under the thumbnails to view, thanks.